Camp of Shufat that was created by UNRWA in 1969. I was wandering through the streets of Jerusalem thinking - ‘wow, I am not a tourist here, I actually live here’. Which sounds amazing, but also carries a sense of ‘impossibility’ to this situation. I can do all the things here that are impossible to do for Palestinians and are rarely exercised by Israelis. Equipped with European passport and looking pretty different I am visibly invisible in this divided city. My difference makes me invisible. I can walk, wander and be pretty much everywhere I like. I can pass through checkpoints freely and I am warmly welcomed in both East and West Jerusalem (ok, perhaps except for orthodox districts). In the Old City Palestinian sellers smiles at me and I at them. Israeli soldiers smile at me and I smile back. Just as a footnote for the English- speaking readers of this blog (hello!) 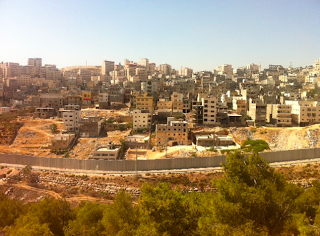 I came to Palestine as part of a larger programme to bring ‘internationals’ to the West Bank to experience life under occupation and to offer what is called a ‘protective presence’ to vulnerable Palestinian communities. We work in seven different locations ; Jayous, Janun, Talkarm (all three near Nablus), Hebron, South Hebron Hills, Bethlehem and East Jerusalem. This 'protective presence' means actually number of very tangible little things that we will be doing everyday- like monitoring checkpoints on the daily basis, assisting Palestinian farmers or schoolgirls getting through the checkpoints supporting demonstration against continuing demolitions of Palestinian households and expansion of Jewish settlements in the West Bank, running English classes in the refugee camps and supporting the everyday activities of Israeli and Palestinian organizations in reducing the effects of the occupation. In Jerusalem, where I will be based, the Israeli occupation has many faces - Jerusalem has been divided in 1848, but ever since the war of 1967 East Jerusalem (that includes the Old City where all the religious sites are) has been controlled by Israel. After so many years of Israeli presence in East Jerusalem, the occupation has become ‘normalized’ to the point that a regular tourist that follow Via Dolorsa might easily think that the Old City is obviously part of the Israeli state. It’s normalized to the point that the biggest checkpoint linking Ramallah and Jerusalem looks like international border. Even if it is a checkpoint build on the Palestinian land in between occupied Palestinian East Jerusalem and the West Bank. Complexity of the situation does not pay favor to Palestinians. Palestinians in East Jerusalem do not have citizenship. They only have residency documents. These documents do not allow them to travel or buy houses or to enjoy similar services that Israelis living in the West Jerusalem enjoy. 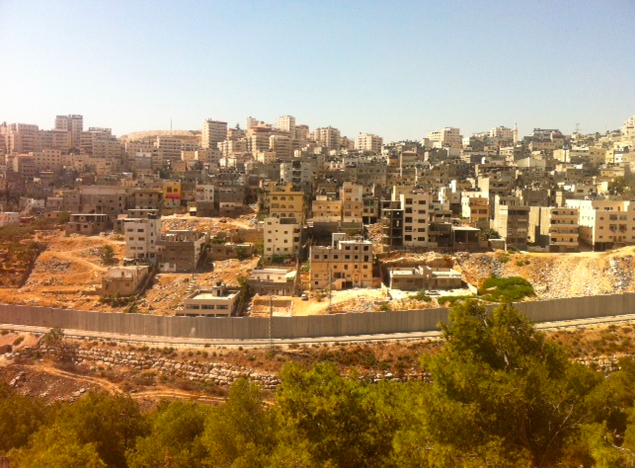 Palestinian households in East Jerusalem struggle from water shortages, electricity cut - offs, limited public transportation even if they pay taxes to Israeli authorities. Palestinian Jerusalemites cannot really marry West Bankers which live round the corner. Well they can, but they would have to move to West Bank and resign from their Jerusalem residency (and house) or live separately. If they stay too long in the West Bank with their wives or husbands are deprived of their residency. The main objective of the occupation of East Jerusalem is the ongoing process maximize the territorial gains by Israel (hence the erection and expansion of the Jewish colonies in Palestinian parts of the town) and to minimize the Palestinian presence within what is now called Greater Jerusalem. This is why the wall here is like a snake - in a physical and metaphorical sense - dividing towns, neighborhoods and cutting off entire communities, from access to work, schools and fields. Families who live 50 meters from each other spend now hours to reach each other, students and workers spend hours to commute, those who stay behind the wall can be deprived of their Jerusalem residency any moment. Occupation also means expansion of the Jewish colonies in the East Jerusalem. Despite countless number of UN resolutions that were forcing Israel to halt the expansion. Occupation also means house demolitions that takes place on the ongoing bases despite the continuous Palestinian presence in the land for generations. Occupation also means narrative dispossession. You can spent weeks in Jerusalem not knowing about any of this. Easily.